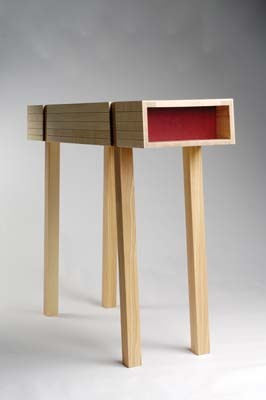 Rod and Alison of Wales & Wales are something of an enigma in the world of designer makers. I've spent some time in their company recently and as a result it made me rethink my preconceptions about these very different but inextricably linked disciplines. Is it a combination of the two or a dilution of skills and constant tension between two opposing forces? If there's one thing I've picked up from Rod it's that design is uppermost in his thoughts. He has little interest in the nuts and bolts of construction. That's not to say that their furniture is poorly constructed, it's simply that with more of their work subcontracted out they're less involved with the minutia of such things. 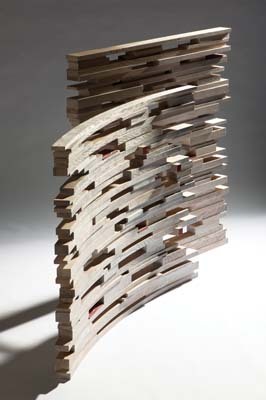 Deliberately releasing themselves from this part of the process allows Rod and Alison to focus purely on design and avoid flamboyant making techniques that are unnecessary and often the trademark of the self conscious and fixated. 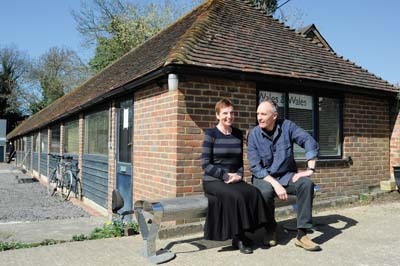 Rod and Alison have occupied their workshop in the Sussex village of Chiddingly since 1980. A former cow byre, it's on the estate of the late photographer Lee Miller. Lee was a supermodel who subsequently turned photographer and gained international acclaim as a war correspondent with the US army during WW2. After the war she moved to Sussex with her husband, surrealist painter Roland Penrose. The new home quickly became a haunt for artists such as Picasso, Man Ray, Joan Miro and Henry Moore. The estate is still in the family - her son Antony Penrose now runs it, and along with a gallery in the yard next to the workshop, the house has become a shrine to Lee. There's an amazing picture of Picasso standing next to a road sign, which is about 100 yards away from the Wales & Wales workshop. An environment more suited to an alternative creative thought process is hard to imagine. 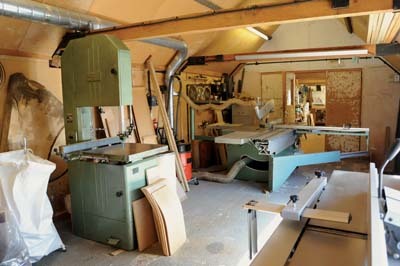 To some extent the workshop is largely redundant and my first impression is that it's over equipped for their needs. The space must be in the region of 100ft long and 20ft wide, so perhaps not entirely conducive to high output but the choice of machinery most certainly is. 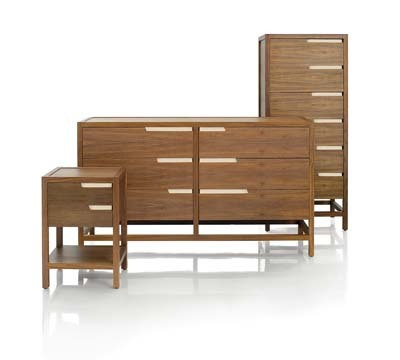 Ironically the catalyst that led Rod to choose the difficult path of furniture maker originates from a desire just to make something himself. Not coming from a technical background, the first furniture he remembers being influenced by were pieces of French baroque in the Wallace Collection. "It was arresting. Remarkable by any measure." Hardly what you would associate with their work today but at the time it acted as a trigger and ultimately led to a two-year course at Rycotewood College. It was as a result of a visit by John Makepeace to Rycotewood, where Rod and Alison were studying, that their passion for design was ignited. His unique approach to furniture openly promoting the idea that furniture has the potential of being viewed as art, something that was far from commonplace at the time. In an instant it changed their view of what might be possible. Three years on and with Parnham still very much in its infancy both Rod and Alison could be found at the now world-renowned college, Rod as a student, Alison as a maker in the Makepeace workshop. sFast forward thirty years and Rod is less directly influenced or inspired by other makers, feeling that you should worry primarily about what you're doing rather than others. "I used to spend weeks and months at the V&A looking at the furniture, but now I am more interested by ethnographic, African, Islamic and Chinese collections." It's clear that in respect of furniture, though not other disciplines, design rather than the craft world has a much stronger pull for Rod. Alison is skilled in CAD and they now use it for all projects. The process starts after a brief has been agreed - discussion, articulating between them what exactly the job entails. The use of words can, if not considered, change the direction of the design process. Rod and Alison start with separate sketch books and when an idea comes out that's worth developing it's put into CAD where it's honed, stretched, squashed, critiqued and very often disregarded. Two-dimensional CAD drawings are followed by 3D mock-ups, which help to visualise the design. These can be full sized or scaled and occasionally made into maquettes. A client is almost always presented with a rendered CAD drawing, sometimes with timber samples. "We don't use photorealism because, firstly it's very time consuming and secondly it can actually be unhelpful, causing concern when the item doesn't look precisely the same as the image. 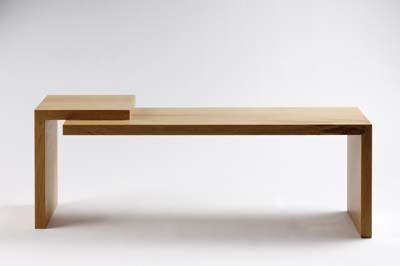 Apart from anything else, wood varies in its effect and we'll try and work with that individual quality in a piece. The change from drawing to object requires a leap of imagination and results in a better outcome." Wales & Wales have for years worked within the mainstream commercial market with designs for Heals launched last year and an urban street furniture branch of their business. Their five-year plan is broadly based on designing for production while not ignoring the opportunity to produce bespoke items. Their designs for other companies are predominantly wood-based products, though not exclusively as their street furniture is a mixture of both metal and timber. They enjoy being part of a team - designing for production only works with a strong team ethic and it's as natural to them as it is alien to others and there are some distinct benefits. The life of a lone furniture maker can be a little too insular at times. Rarely now do they work on designs other than their own, though in the past they have found it to be interesting and quite educational. When they employed people it was imperative to keep them busy so collaborating had its advantages. As I've mentioned, a great deal of the making is sub contracted out, a fact that they are entirely happy to acknowledge, particularly as the UK is blessed with so many gifted makers. Rod will very often work on components that require aesthetic decisions (as opposed to technical ones) during the process of manufacture. Once completed, these are then shipped out for assembly elsewhere. 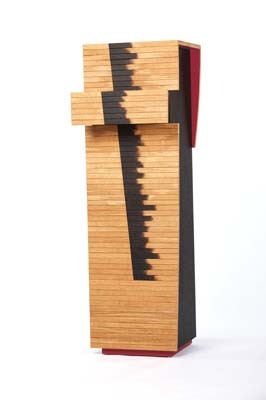 It's rare that he will make a piece from beginning to end, but a recent exception is a sculptural screen commissioned for a corporate collection. It's not just a matter of no longer enjoying the making, though this is to some extent true, there are some very practical reasons behind this decision. What's interesting is that Rod and Alison have changed direction without trading places, which affects what they do and how they do it. On the question of business and starting out Rod had some experiences to share but was keen to add that there are no sure fire answers and no one true path. Exhibitions, while for most probably a necessity, are problematic and costly with no guarantee of any success. Having not exhibited seriously for some years, they will have made an appearance at Collect, a show held at the Saatchi Gallery in London in May by the time you're reading this article. "Business," says Rod, "is about profit. It may not all be about profit, but unless there's a profit, there's simply no businessâ". A position Wales & Wales have been perilously familiar with on more than one occasion. To anyone starting out they recommend gaining experience in as many workshops as possible, to see the various ways of doing the same thing and how other workshops run. Rod admits that his early years of practice were largely about process, chasing new techniques and keen to learn all he could. He is now less interested in the overt expression of a process, at least as far as displaying examples of gratuitous technique goes, (a very long way from French baroque and the Wallace collection). For me this seed of change is what separates Wales & Wales from the whole designer/maker movement. A design historian once described their work as "contemporary vernacular." This might explain why Wales & Wales don't fit into any particular style or it could be that their working methods enable them to stand outside of the general run of things. Either way the design identity they have seems a good measure of their success. A design identity does not come quickly and cannot be created out of nothing. It grows and is its own entity, entirely organic and Wales & Wales have it. Win a bespoke training course with Marc Fish for FREE!